English Defence League clash with anti-fascist groups in Manchester. AN English Defence League supporter has been fined for his role in the organisation’s October protest in Manchester city centre. Lee Howarth, 24, from Milnrow in Rochdale, was arrested at Piccadilly Station on October 10, after shouting abuse and swearing at police officers. 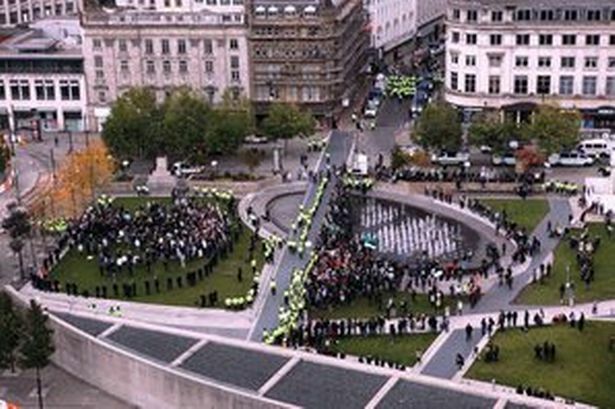 Hundreds of EDL supporters gathered on the day to demonstrate. Manchester magistrates’ court heard yesterday how Howarth, who is unemployed, persisted in swearing at police despite repeatedly being told to ‘calm down’. Howarth was drunk at the time. Philip Lythgoe, defending, said Howarth accepts he swore but that it was in response to being ‘pushed around by police’. Howarth pleaded guilty to a public order offence of using threatening, abusive or insulting words or behaviour and was fined a total of £100. The EDL claims only to oppose radical Islam but supporters were seen at the October demonstrations making Nazi salutes. Around 1,500 people joined a counter protest by Unite Against Fascism and the two sides faced-off for five hours, separated by police in riot gear and on horseback. A total of 48 people were arrested during the day and the demonstration left the city with an £800,000 bill.